Before Matt even moved back home from a work assignment, it was decided. We would get a second dog. He would argue, and still does, that it will be his dog. A little buddy that he can bring to ride shotgun in his pickup truck. Or take agility courses. Or snuggle in tight for an afternoon nap on the couch. 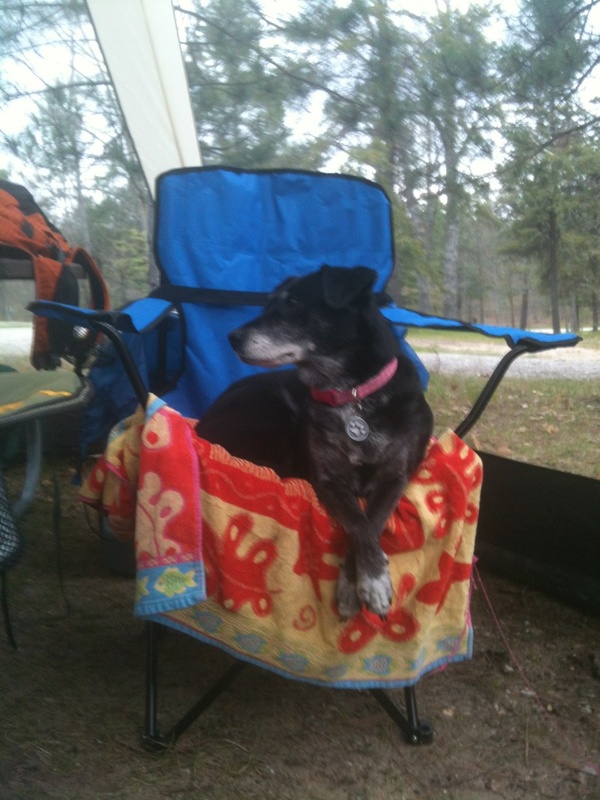 Pampered pup Lexie, shown here on a recent camping trip, would love a little brother or sister. Of course, he knows better. I would like a dog, as well. So we will compromise and get a dog together. Timing is everything, and the timing is perfect for a new pup. Matt is between lawyer jobs, and has the time to help acclimate a new dog. And our dog Lexie is getting a little long in the tooth. To be exact, she turns 14 this month, and last week she was diagnosed with dementia. Also, she’s been a bit lonely since her lifetime companion Lili died last year. Our cat, Pink, has volunteered to snuggle with Lexie, but she says it’s just not the same. Since Lex is such a delicate flower, we need a mellow, super laid back dog. Aggressive sorts not invited. Also, we would prefer a small-to-medium sized dog. The dog must dig/like/tolerate cats. Minimal grooming would be nice. Join us as we chronicle the drama, suspense and excitement on the path to find our next Furever.